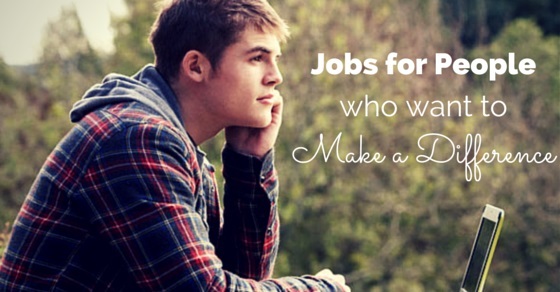 Do you wake up every day thinking of what you can do to make a difference to people’s lives? You should definitely think about selecting a job which can be of help to others and which can make your life meaningful. After a long day of work, when you think that your job has affected the lives of many people in a positive way, you feel a sense of satisfaction. There are various jobs which are driven by the sole purpose of making a difference to people’s lives – some of them are paid jobs and some are non-profit jobs. Job satisfaction helps in keeping you happy and this is extremely healthy for you and everyone present around you. A recent study which was conducted showed that college students wished to enter a job which creates an impact on people’s lives. One of the most important reasons why you should choose a job which can make a difference to people’s lives is that there are a plethora of job opportunities in this field. You name any of your passions and there is a job position available corresponding to that. So, you can enjoy your work and have a sense of satisfaction that you are doing good for the people. This will boost your passion and you can give more effort to give the maximum. The working process of jobs that make a difference to people’s lives is not based on achieving targets, this doesn’t mean that they do not need to concentrate on their performance. Good quality performance is expected from people who enter such jobs that target to the betterment of people. We often see that some people’s hearts are not involved in their jobs. This makes their jobs just a means of earning money for them and does not involve any job satisfaction. But, in cases of jobs that make a difference, your heart and head is equally involved, which makes the working an enjoyable process. Jobs which are aimed at making a difference to people’s lives require fresh talents, for, example, MSW college graduates. Their minds are very fresh as they have just stepped out of college. So if you are recent pass outs and possess zeal to work and do good to others then these types of jobs will provide you with an opportunity to do both together. This is the best way in which you can learn how to budget because such jobs pay a small salary as compared to other jobs which are highly paid. In high paid jobs you often forget the necessity to put a check on your pocket, however, with these jobs you will get automatically aware on the ways to budget which will help you in the long run. The work environment in such jobs is extremely pleasant because there is not much competition and everyone has the same goal of making the world a better place. Because of that working in such a sector or office is all fun being amid all the motivated individuals with positive vibe everywhere. Education is considered to be one of the most important aspects which help in building the society. Teachers are the means or channels through which education is imparted to children. Teachers are considered to be next to God because they help in moulding the personality of an individual. The teacher is the first guidance after mother, who teaches and guides a child as he or she grows up. Only a teacher can make a child face the world with all its good and bad sides and can him into a good and successful human being. Teachers are the people who play an important role in developing the future generations. They create the fate of a nation in the form of youth’s who come forward and shape the nation. They provide you with the inspiration to think big and also encourage you to take a difficult step in life. The motivation they provide helps you in succeeding in every aspect of your life. Due to their inspiring personality, teachers are the role models for most children. They also help people cope with a disability or other major problems of society, such as, domestic violence or substance abuse. Anybody facing any problem can approach a social worker and he or she will do their level best to help the victim. The main aim of social workers who focus on the field on child, family and school, is to develop the psychological and social functioning of children and to improve the lives of their families. They help children in getting connected with various organisations, which can help them in their situations. They also strive to get governmental assistance to make the lives of people decent. Social workers, who are related to the field of medical and public health, provide physical and psychosocial support to people who are suffering from illnesses which are chronic or terminal. They ensure that the patient gets proper care once they are discharged from the hospital. Social workers, who are involved in the field of mental health and substance abuse, help in assessing the situations of people suffering from mental illnesses and substance abuse problems and also provide treatments for these problems in the form of social rehabilitation and individual therapy. These jobs help you in making a difference to people’s lives and at the same time these also help you to enjoy a great pay scale. The jobs of doctors and nurses are the ones that are in great demand, nowadays. People involved in the health care sector are driven by the major aim to save people’s lives, which makes these jobs impactful. Other important jobs in this field are health care managers and therapists. A doctor’s job is to promote the health of people by treating diseases. They provide support to people and their families in times of need. A nurse’s job is extremely meaningful because she helps people to recover from their illnesses by providing medicines on time and also by educating them to deal with their problems in a better way. Besides this, a nurse also provides emotional support to the families of those who are suffering from problems. An occupational therapist helps people who are suffering from physical limitations to take care of themselves. They provide guidance to these people and encourage them to try out ways in which they can take care of themselves so that they do not have to depend on others. This helps in building their confidence. The major aim of an activist’s job is to make the world a better place by fighting for social, environmental, political and other important causes which are of importance in people’s lives. An activist’s job includes work, such as, conducting awareness sessions, conducting activities with the aim of raising funds and organising media campaigns. A counsellor’s job is gaining immense popularity because of its ability to bring about a change in people’s lives. A counsellor is a person who has received special training to provide advice to people to help them deal with various situations. They are people whom you can turn to for advice at any time. Counsellors dealing with mental health help people suffering from disorders to deal with their situation and also recover from it. Counsellors related to the field of marriage and family help in improving the lives of married people by solving their problems through discussions. Counsellors dealing with problems of substance abuse and disorders in behaviour help in finding out the main causes for these problems and also help in providing a way out of this. Counsellors who work in schools also have a great role in shaping the lives of children. They help students in their academics and also help them in choosing a suitable career. They help in building confidence in children. Even though their job involves a lot of risk, they go all their way to rescue a person during a fire breakout or in case of any other accidental urgency. These persons are available 24/7 for any kind of emergency assistance. Fire-fighters help people in recovering from their loss by providing them with necessary resources after any fire-break out or in case of other emergency. Whether the problem is big or small, they are readily available all the time to help people in case of any danger, mishaps, accidents or any inconvenience. They help in effective functioning of the companies by checking whether all their documents are filed accurately. This helps in preventing any harm to the stakeholders of the company. The ethics officer handle problems related to labour, harassment, accounts, antitrust and discrimination. They play a big and significant role in solving several issues related to these areas. Their job is to develop the code of ethics of a company or organisation. They also help by organising training programs to make people understand the importance of ethics. One of the major facts that you should always remember about such jobs is that your efforts might not change the world immediately, but, these will be a stepping stone to make a difference to people’s lives by helping them in times of need. People who have a passion for serving people are the most suitable for such jobs. Studies conducted have come up with the finding that being happy in your job and enjoying your job will keep you healthy and will also keep everyone around you healthy. You can only make a difference to other’s lives if you make a difference to your life first.